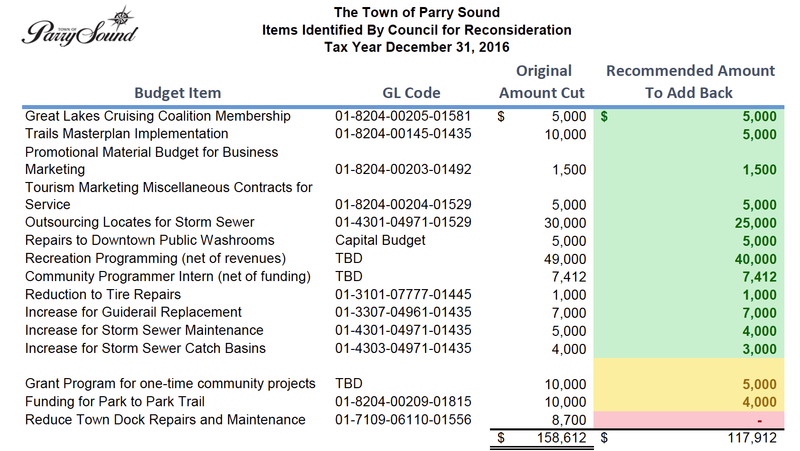 Council approved the Town of Parry Sound 2016 Budget earlier this evening, which comes with a 3.16% levy increase. I have dubbed it the “Pickleball Budget”. There is no malice intended with this nickname. It is named this because of some additional expense additions to the budget that raised it above the informal target of 1.9%. This included $40,000 for community programming. And Pickleball was among the listed community programming activities. How do I feel about the budget? I think Staff and Council did a good job of balancing the many competing priorities. Are there some expenditures that I don’t like? You bet, but not so many that their elimination would have brought us down to the original 1.9%. So I’m happy to live with it. I applaud Staff and Council for getting the Pickleball Budget approved before the end of January. It still needs to be ratified as a By-Law, but that appears to be a formality at this point. FYI, here are the additional budget items approved at this evening’s meeting. And if you are interested in a list of the other Community Programming activities planned for 2016, here is a list of activities noted in an earlier budget document. In case you’re wondering about Pickleball, here is a link. It’s basically a cross between tennis and table tennis.